A day before the 4th anniversary of the #Jan25 revolution, a 32- year -old mother, activist and poet Shaimaa El Sabbagh carried a wreath of flowers and went to Tahrir square to commemorate the victims who lost their lives over the last 4 years. Egypt Rose didn’t know this would be her last walk to liberty Square. An Egyptian sniper gunned down Ms El Sabbagh and left her to bleed to death in the street. The tragic image of her friend holding her fragile body, while blood covered her beautiful face was too much to bear for millions of Egyptians. How to face the world without her.”…. In the last four years of the revolution, 100’s of activists were killed or lost their eyes to Egyptian Snipers, who are always in denial and… always anonymous. ‘Snipers’ in Egypt don’t make movies or write memoirs. However here in America, Snipers are celebrated and their violence is glorified. The American Sniper movie, which I didn’t watch, and I don’t think it sits on a lot of Arab Americans ‘to do’ lists. It is a movie about the Navy SEAL Chris Kyle, credited with the most kills in U.S. military history (250, 160 confirmed) broke box office records upon its release and is reportedly headed toward gross earnings of $300 million dollars. The movie was directed by none other than Clint Eastwood, the Dirty Hairy cowboy. It was nominated for six Oscars including best picture and was released, incidentally, at the same time as a movie, Selma, that told the story of Martin Luther King and the civil rights movement. That one did not receive as much attention nor as many Oscar nominations. In the movie Mr. Kyle’s behavior is driven mostly by his own self righteous virtues. He didn’t give us the context of an illegal Iraq war that by conservative estimates, left 1 million Iraqis dead, made 4.5 million refugees, widowed nearly 2 million and some 5 million children were orphaned. The fact that those ‘savages’ were fighting foreign occupiers was never mentioned. Chris Kyle regarded this woman as a terrorist, which doesn’t really differ that much from the foreign policy where President Obama launched the biggest state murder camping in American history, as Noam Chomsky describe it “… the drone campaign, which officially is aimed at murdering people who are suspected of maybe someday planning to harm us.” Obama’s killing list, is the equivalent of Salman Rushdie’s fatwa that was issued but never carried out by Iranian grand Ayatollah. “American Sniper kind of reminds me of the movie that’s showing in the third act of Inglorious Basterds,” tweeted actor Seth Rogen. The inference is clear and intentional: the sheepdog is the righteous American sniper whose mission is to protect his men against the evil Iraqi wolves. Meet Humom Samarrai a high school student, blogger, poet and soccer player. He knows one of those Iraqi wolves, his uncle, who was shot by An American Sniper during the invasion. The American Solders who shot him stole $10,000 from his body. “My uncle was a POW in Iran for 16 years, and when he was released he went back to Iraq, got married and had 3 daughters, when he was coming back from work he was shot by an American Sniper for no reason” Hummon explained on our FAcebook conversation. I close with this letter his sister wrote about her slain uncle. I wanted to share some really sad family news that we were just stricken with yesterday. My uncle Abdulrazaq (my father’s younger brother who is 50 years old) was in Iraq (in our home city of Samarra, Iraq) on Thursday January 5th, 2006 and at 8pm went to go meet with his business partners to finish financial exchanges and on his way back he was killed by American troops. Upon stealing the $10,000 that were in his coat pocket the troops that the Americans are so proud of and support, found that he did not have any weapons or explosives and then they dumped his body at the local hospital and walked away with his money. My cousin is a resident physician at the local hospital. The Americans had notified them that they were bringing in a dead body and to come and receive it. Upon going to receive the body from the Americans outside of the hospital he was shocked to find that this is his uncle. At home his wife was very worried as he was extraordinarily late for dinner. She called other family members who called the hospital (which is something people typically do since so many people are dying since the U.S. invasion) to see if he had an accident, at which point my cousin answered informing them that his body was just dumped at the hospital. Our family was contacted and they came to receive his body. He was shot in the head, abdomen, and in one of his kidneys and it is believed that he died immediately, though the details of whether they robbed him before or after they killed him and when they decided to dump his body are unknown. He left behind a wife and two daughters age 4 and 5. They are still not sure how to break the news to his daughters. My uncle had spent 16 years as a prisoner of war in Iran. He was freed on April 9th, 1998 (even though the Iran/Iraq war ended in the late 80’s). Upon starting his life again in 1998 he married and had two beautiful daughters. 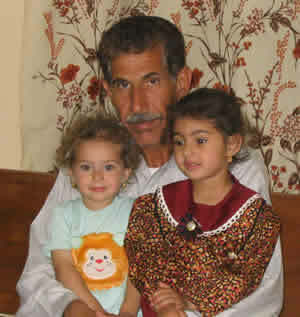 Although it was always hard for him to talk about the torture in the Iranian prisons, his daughters Shayma (5 yrs old) and Yamama (4 years old) always had a way of transcending words such that they seeped into his heart in the most natural and miraculous way and when he played with them he was free from his tortured thoughts and pains. My uncle Abdulrazak is not the only one, there are thousands that have died in this way. This is the face of American terrorism. Our family is so numb. Our hearts are swollen with grief, resentment and sorrow. American soldiers sign up to risk life and death and when one of them dies it is thought the earth stops its rotation, but when an Iraqi civilian who is working hard to support his family and is forced to live his life in the midst of an American occupation is murdered and robbed by sweet American boys, he is dumped like road kill. What makes their lives more worth living? Is it the blue eyes and blond hair? Or is it the cross that hangs on their necks? I wonder what defense they have for this one. Did he part his hair on the wrong side? Did he wear the wrong color? Was he driving ‘suspiciously?’ What would they say he did to deserve being murdered? How about robbing him? It must not have been a robbery. Maybe they were afraid that a doctor would steal his money so they kept it for safe keeping. Maybe they wanted to take the money and buy a gift for his daughters. Whatever it is it must be good because they are Americans! In fact as they provide this hypothetical justification (assuming they would be prompted to do so – which wouldn’t happen because Americans answer to no one) I can just hear the national anthem playing in the background. My uncle’s murderers will come home to their families one day to tell of the heroic stories but humbly refuse to be called heroes and instead insist that they were merely doing their duty, but in their soiled hearts they will carry the ugliness of what they have done and who they became and it will eat at them until it destroys their lives and the lives around them.